Back in the days when gameplay was key to a successful game, gaming technology was making massive leaps and bounds. When you look at where we are today, with the snazzy graphics and the computing power to finally deliver excellent gameplay AND snazzy graphics, it’s hard to believe there was a time where you really needed to make the choice of one or the other. Arcade games, despite their dedicated hardware and often inventive and original control methods, still had to make the same choice. Atari clearly forgot this and released Pit Fighter anyway. At the time, the graphics pulled in people for a game or two, but the lack of depth, lack of playability, and, probably worst of all, the lack of balance ensured it wasn’t a roaring success. It was never going to be anything other than what it was, a gimmick of a game ruined by appalling controls, and, despite the digitised graphics, proof positive that 4 frames per second does not a good game make. However, all is not lost. Thanks to the wonders of retro gaming, retro collecting and appreciation of the history of all things retro, this game has found a small corner in my heart. Yes, it’s bad, but only if you look at what else was around at the time. 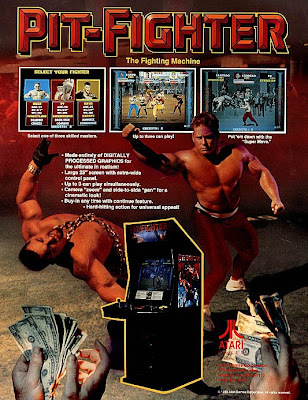 Pit Fighter was up against some mighty stiff competition in the arcade department, many games had graphics almost as good, but superior gameplay. Mortal Kombat, for instance, was an example how a game of this type SHOULD have been. 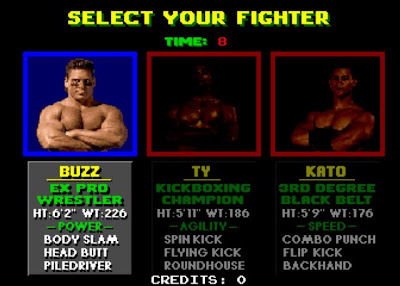 So, you take the role of a bare-knuckled prize fighter, either a big wrestler by the name of Buzz, a Thai kickboxer by the name of Ty (Imagination was hard to come by in those days) or a Chinese Bruce Lee-alike named Kato. Very simply, the objective was to batter your opponent until their energy is depleted, lest you be battered to the same extent. The eager crowd would occasionally get involved, sometimes walking into the arena, thrusting a knife, and then stepping back in again. On other levels a variety of weapons were available and could be used until destroyed, and sometimes you might find a Power Pill inside a barrel or crate. This would temporarily make you... erm... well... better somehow, I guess. Fairly uniquely, the enemy could also use the Power Pill, ramping the difficulty level up by a considerable degree. 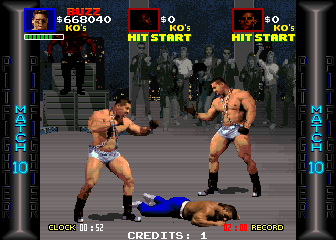 With a basic move set, and no real "special moves", this game was basically trying to be the nearest thing to UFC , but before UFC was even a twinkle in the eye of the fans of blood and violence. 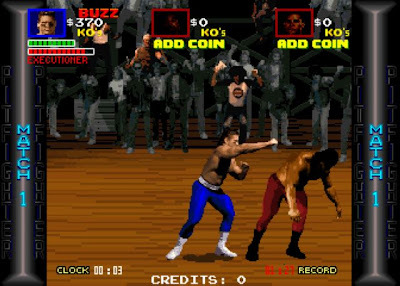 Unfortunately for Atari, who followed Pit Fighter up with their “sequel”, Guardians of the Hood, it seems as if they didn’t know what was necessary to create a winning formula for a fighting game. Still, the basis was there for what could have been an arcade smash across the world. Scaling, digitised graphics, a decent enough concept, but simply not enough frames of animation to REALLY make it stand out, and not enough gameplay to make the game stand up on its own merit. 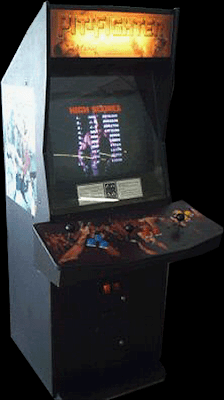 But that’s not to say there’s no nice touches to it; the bonus “knockdown” game where you try to knock your opponent down three times, for example, or the crowd getting involved in the fight, or the timer that records the “record win time” for each opponent, or even the varying stages of being “stunned” or knocked down. Yes, this was probably a good example. If you took a good hit to the chest or gut, you might double up and recover in a few seconds, or you might be knocked to your backside, with a slightly different recovery. Take a blow to the face and you might briefly sink to your knees, be knocked flat out on your back, or even be spun to land on your front. It wasn’t simply a case of take 3 hits and down you go, unfortunately the outcomes appear to be random. Still, It’s a game of importance in arcade history, even if it is for the wrong reasons.